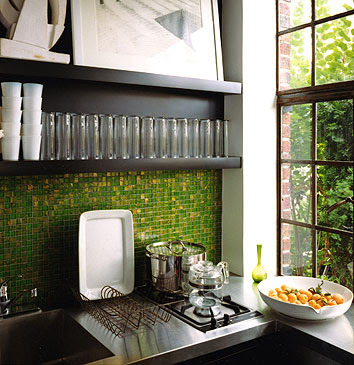 Le Gemme glass tiles Bisazza Bisazza tile is all the rage right now. This one has touches of mustard yellow to accentuate the green more. 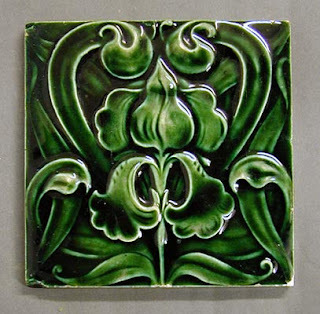 Nature of Green: Green is a restful color with some of the same calming attributes of blue. Like blue, time moves faster in a green room. Green of renewal, fresh energy and new beginnings. Green is very nourishing to to your health, it calms your nerves and balances your whole body by bringing healing vibrations from Nature. 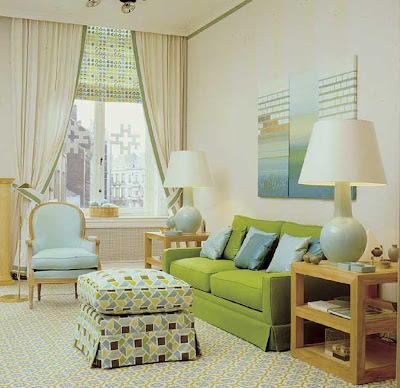 Culture of Green: Because of all the green in nature the color is reminiscent of Spring. Coupled with red it's a Christmas color. This is one of the best post I have seen in a long time! 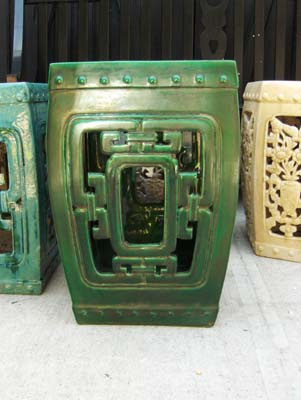 I adore the color green, it’s probably my favorite color and yet it is no where in my home!?! 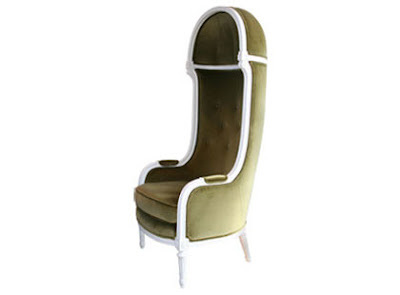 Maybe I need to think about how to incorporate it into my decor. Love the Mary McDonald photos. This is a great post! Informative and just full of inspiration. Beautiful images. 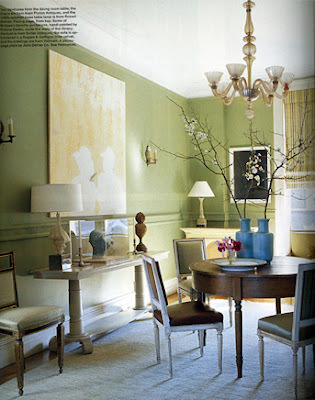 I have often thought of green as a neutral, although of course, it isn't, but green is such an organic color. What's your thought on that? Wonderful post! All of the designers you mention are so great, and I just cannot get enough of that KWID Wallpaper! P.S.S. You are a wonderful designer and congrats on your AD spread! 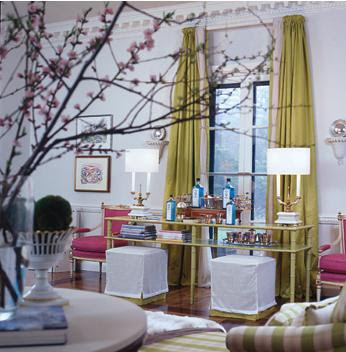 That apartment of Chloe S.'s from H&G is one of my all-time favorites. I loved the way it was styled as well - the bike with the basket, the vintage Hermes and YSL white bags hanging from the doorknob. It jump started my obsession with Imperial Trellis. Great post! then take it from there, or maybe green in a toss cushion. 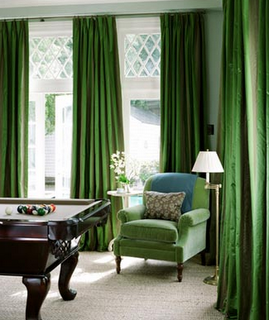 I am considering putting green linen flowing draperies in my new home. I think I will never tire the color green. You must also love green, because it is on you opening page of your web-site. Green is organic! Thanks for your kind words. 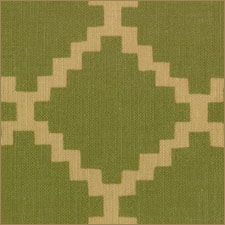 I also love KWID, but wonder if I could live with that much pattern for the long term? I think it makes for a beautiful photograph. Wonderful to get inspiration isn't it. Thanks Kelly Wearstler. Quite a few of my favorite rooms are included here. Love this! has back issues. Good luck! Great post about green. 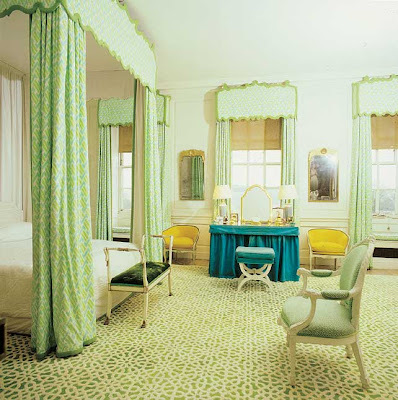 Love the last David Hicks room - it could be designed in 2007 for all of its timelessness. Great post - green is also my favorite colour. I especially love the rooms by David Hicks, Mary McDonald and Eileen Kathryn Boyd. 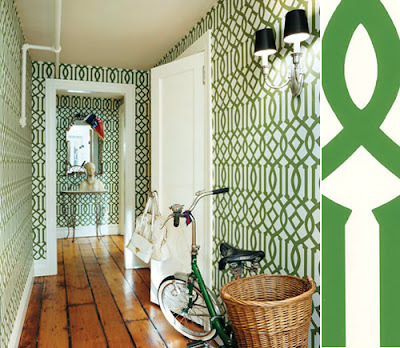 But I have to say there are not many people who could get away with a room overdosing on green like Kelly Wearstler does. I adore that study of hers! I think David Hicks is a classic. I am new to the work of Eileen Kathryn Boyd and like the splashes of color she adds to an otherwise all white room. She does much the same as David Hick does in his all white rooms. The punches of color act as punctuation marks. And Kelly Wearstler doesn't do anything but bold and over the top, and I think that is what makes it work so well. The Bisazza tiles are to die for! I have always loved greens/blues! This is such a great post. I particularly like the Eileen Kathryn Boyd pictures. Personally I find the easiest and best way to get green into a room is to get some nice big plants. They really brighten up the room and look pretty.